We’ve put together two exciting games that neatly continue My Keyboard Adventure learning path. The first three games are all about mapping out the keyboard, and now it’s time to hop on the keys and start typing! The first game is based on the classic bubble shooter concept, which will keep the young minds interested and engaged. 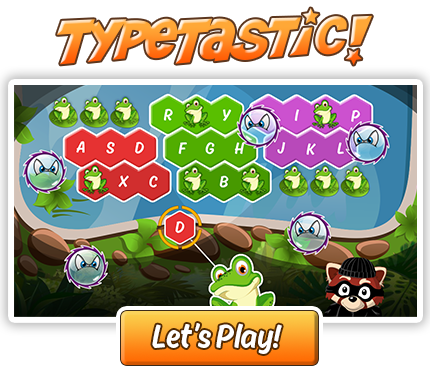 The gameplay is simple yet addicting: catch, aim and shoot bubbles by pressing the correct letters on the keyboard. Your goal is to get at least three bubbles of the same color together to pop them all away and to collect bonus items. As always, there’s a learning path behind this game, too. The main goal is to get the feel of using the physical or on-screen keyboard – learn how to fluently find and press correct letters. It also teaches the kids to coordinate their eye and finger movements so that they can tap a key at the right moment while looking up on the game area. The game sets you on a thrilling underground adventure into a mine! Our hero, the hedgehog, is on a mission to take home the little ducklings who are playing in the mine tunnels. The player will guide the hedgehog to the ducklings with lifts and gates by using the keyboard as a control tool. This game presents a new learning challenge as the player has to solve small puzzles while keeping eyes on the moving hedgehog and looking for the right keys to press. As you see, the games are getting gradually more challenging, but one thing hasn’t changed: it’s a FUN learning experience!